The city of Minneapolis has set aside $350,000 towards studying the possibility of reconstructing Uptown’s West 29th street as a pedestrian-only boulevard. Uptown is a tough combination of pedestrian-scale storefronts and speedy auto thoroughfares, so a pedestrian connection that’s being compared to High Line Park could be the necessary cream filling for a truly stellar pedestrian experience. While every project designer seems to want their pedestrian-oriented street project to end up ‘High Line-y’ regardless of any contextual similarity to the High Line, I believe that this project is sitting on enormous potential. I’ve heard a lot of skepticism for this project, which is rather understandable. For the last few years, the street has been far more of a place to avoid than a destination. Even with a complete rebuild and car traffic restricted, there’s currently not a ton of non-sketchy reasons to occupy what amounts to a glorified alleyway. The street’s most meaningful pedestrian draw was probably the now-defunct Uptown Market, which operated between Lyndale and Dupont until 2012. The market sadly didn’t attract the critical mass of vendors that would attract crowds and keep the market afloat. Honestly, we’ve got post-industrial rail infrastructure reuse plus top down people watching.. ok it basically is the High Line. …all surrounding what will be one of Minneapolis’ grandest plazas, as a part of Elan Uptown’s phase 2? Sounds like a pretty fantastic place to sell produce, in my mind. What’s emerging is an area that is really born to be a destination. The people watching from the Elan plaza will be simply too good, the pedestrian draw of Lake St too proximal, and bicycle connections to the rest of the region too immediate. The only factor keeping this from being a Pike Place Market, besides the market, is something to draw people on a daily basis. It’d clearly be marvelous if neat and narrow ground floor retail spaces lined 29th along this stretch. Ackerberg’s Mosaic Phase II development will accomplish this with two retail spaces between Girard and Fremont. The Uptown Rainbow was sold to Cub Foods recently, so previous redevelopment plans may be a closer reality. The Uptown Rainbow parcel extends across 29th to the Greenway, so the Dupont to Emerson segment represents a short term challenge for the project. It would be very convenient if the site’s redevelopment coincided with 29th’s reconstruction, although nothing has been announced to this effect. A 29th street redeveloped Cub entrance holds many possibilities. The other four blocks, however, have enormous potential when it comes to hosting events and temporary uses. I can’t help but imagine the The Uptown Art Fair spilling off on Hennepin onto an equally robust stretch on 29th. There’s also not a ton of room in Uptown for public events that aren’t quite important enough to shut down Hennepin, but could definitely fill up Bryant Square Park or the Mall. This could open up possibilities for craft fairs, community yard sales and a host of other smaller events. The corridor still needs a daily draw, something flexible that can accommodate a fluctuating event schedule. For this, I turn to food trucks, fashion trucks, and other creative temporary uses. Food trucks are blessed and cursed by their mobility, although an established food truck plaza could become a destination unto itself. As Minneapolis food trucks can’t be “within 100 feet of a restaurant with direct access to sidewalk or sidewalk café on the same block face,” 29th’s sparse retail would actually make for a uniquely streetcar-flexible setting. Uptown doesn’t currently hold the daytime population density that would be necessary to support a full cadre of carts. At the same time, food truck festivals are pretty consistently over-packed with people begging for the stuff. Who’s to say that this stretch couldn’t be an evening refuge for Nicollet’s midday food trucks, harnessing some of the festival draw that makes food truck fests so annoyingly popular? Beyond being a destination, this space could also serve as a regional incubator for fringe retail and food truck concepts. It’s been really exciting to watch chefs use the food truck setting to experiment, only to end up successful enough to make the jump to brick and mortar. This has certainly enriched our restaurant scene; I only wonder what kind of similar impact this kind of dedicated space could have within retail. With all parties on wheels, the whole endeavor could be consistently rearranged to accommodate new ideas and businesses. This could be similar to Craig Blakely’s idea for an ‘Art Train’ Creative Enterprise Zone in St. Paul’s West Midway Industrial District. Even while in consistent flux, the street would certainly gain a reputation as one of the more engaging streets in Uptown. One of the recent additions to Minneapolis’ storefront food truck roster. An open house for this project is being held this evening at Elan Uptown (2837 Dupont Ave S) from 6-7:30. Definitely stop by and let your dreams for the space be heard! Didn’t Minneapolis (and Henn Co and MnDOT) recently endorse the NACTO Urban Street Design Guide? This is a test of if they actually mean it. These are the exact ideals that this street needs. I think we need to extra make sure this isn’t just a street rebuild with ‘pedestrian only’ signs, such a wasted opportunity. That being said, I’m fairly sure that something creative will happen in that space regardless. There’s simply too much awesome-density! Such good ideas. This is an amazing opportunity for creative collaboration between artists, entrepreneurs, urban designers, and developers. C’mon Minneapolis! Nice post. Aside from the Rainbow challenge, this could be a relatively easy and inexpensive project that could spur high return. It’s a shame that Lake St, especially the one-way portion, is so pedestrian-hostile despite the (mostly excellent designed) storefronts that face it (Cheapos and vacant lots waiting for hotel/office buildings notwithstanding). It would be great if a project like this could really catalyze the need for a Lake St re-do sooner than scheduled, making the more temporary/inexpensive spaces on 29th and full-blown brick and mortar along Lake *both* great pedestrian places. A rebuilt, more narrow Lake Street is pretty close to the top of my Twin Cities planning Christmas List. Considering it was rebuilt only a few years ago and for not a small cost, what’s realistic timeframe to expect the next reconstruction? Well, Hennepin County is planning on rebuilding it from Blaisedell (?) to 3rd Ave (?) sometime soon as part of the !-35 widening project. Problem is, they will make it wider and more auto oriented. Do you know where I can find more info on that project? Turns out the reconstruction of Lake is between Blaisdell and 5th Avenue. I was disappointed to have missed the meeting tonight — will be curious to hear the updates. I would love to see urban gardening incorporated into the plans; perhaps a series of raised beds along the corridor to serve all the new apartment dwellers with no garden space of their own? Uptown is sorely missing community garden space (there is Soo Line, but clearly their space is limited), and I know from first-hand experience how community gardening can really bring people together. Intersperse the beds with spaces for community gatherings — tables, playground equipment, maybe some outdoor grills, a community pizza oven — and then we’d really start to have something special. I’m all for small retail opening onto the space, too. I was one of the founders of Uptown Market, long-term volunteer, chair of the board, etc. Transitioning 29th street into a bike/ped street that could host a semi-permanent market was part of our long-term vision. There is no question that a public market can succeed in this location if the street is redesigned to make it an appealing destination. A big part of our problem was that we were just a bit ahead of our time. For 3 years we ran the market on what was basically a dingy and run-down street. Not an appealing destination for customers or vendors. We had a “build it and they will come” philosophy – we thought we’d establish and institutionalize the market, and this would build support for rebuilding the street. Understandably, not everyone was willing to squint their eyes and ignore the weeds, rusty fencing, and pot-holed street. Despite the many challenges we faced, the market succeeded in many respects. We did transform an ordinary street into a vibrant public space for one day per week, for three years. We created a venue for local entrepreneurs, many of whom were first-time vendors. We had a cadre of regular customers. The market was defiantly local and non-corporate – a counterpoint to the changes at Henn and Lake. Importantly, the market never lost money. More than anything else, we stopped operating the market because of the extreme time commitment required of our volunteers. With no paid staff, operating the market took a toll. After three years, we couldn’t manage the level of marketing and vendor recruitment that was needed. The market was clearly in decline, and we felt it was better to end it rather than keep something going that wasn’t what it once was. Hopefully a reborn Uptown Market will return to this site. The best prospect for doing this, in my view, is to recruit another market to expand. Kingfield now runs several markets – maybe we can be the next one. The CARAG neighborhood group even has some money left over from Uptown Market – perhaps they could make a start-up grant available? We still have a list of vendors, an archived website, sponsors who would likely return. We just need the street. Re-build it and they will come! Great discussion on this thread, very exciting that this is under consideration. Hey Brendon! I’m so glad you found this article, although I almost wish I had a chance to chat with you beforehand! 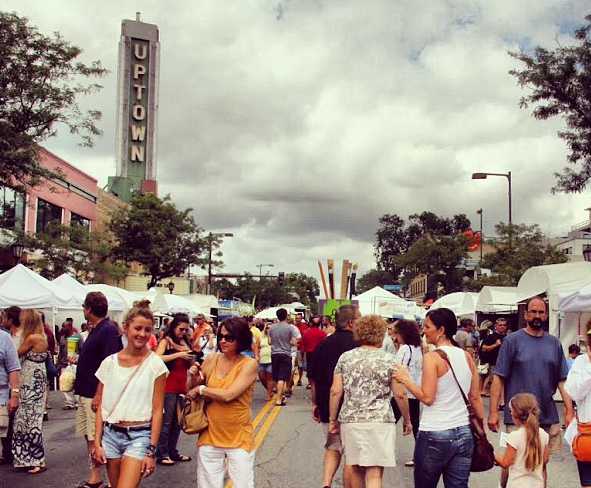 Do you know what CARAG funds were dedicated to the Uptown Market? I’m on the CARAG Board and would love to help a market return to that space. Would you be at all willing to come to future 29th Street open houses (there will be more this summer) and show folks how very much in the cards this would be? I think folks are a bit on the nervous end, as the street is pretty far from inspirational. They love the idea of a market-oriented street but have no idea how feasible it would be to get it running again. Awesome that you’re on the CARAG board. Let’s connect – I’ll shoot you an email. This is totally doable. Not easy! But doable. So privileged white kids who moved into the big city want more amenities in their amenity dense neighborhood? Does Uptown really need more improvement? How about spreading some if this ‘urbanist’ thinking to places that really need it instead only on your doorstep. We do try to spread ‘urbanist’ thinking, and this is what happens. We’re still doing our best though! I don’t understand the problem. So when the city inevitably resurfaces the street, it shouldn’t be designated a ped-only marketplace? How much money do you suspect this project will siphon off from other areas of the city “that really need it”? Sounds like the market itself would already be privately-driven, so no need to redirect scarce funds there. The mind is boggled by your sentiment. So the residents of CARAG or Lowry Hill East shouldn’t care about an opportunity for more vibrancy and growth in their neighborhoods? They shouldn’t be acting locally? An odd criticism indeed.